In Volume 19 of Pretty Pear Bride, bridal inspiration for plus size brides, we are sharing all about plus size workout outfits and swimwear. Including the sharing our top picks from Nike's newly launched plus size workout gear. It's that time of year where the weather is warming up and that means time to show more skin. 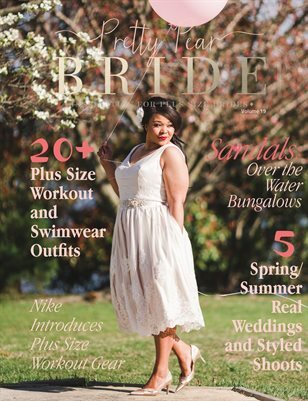 We are also sharing some of our favorite plus size real weddings and styled shoots perfect for spring and summer plus size brides. And in our honeymoon and travel section we are taking a look at Sandal's new over the water bungalows.